What treat wiggles and jiggles and is sure to make them giggle? 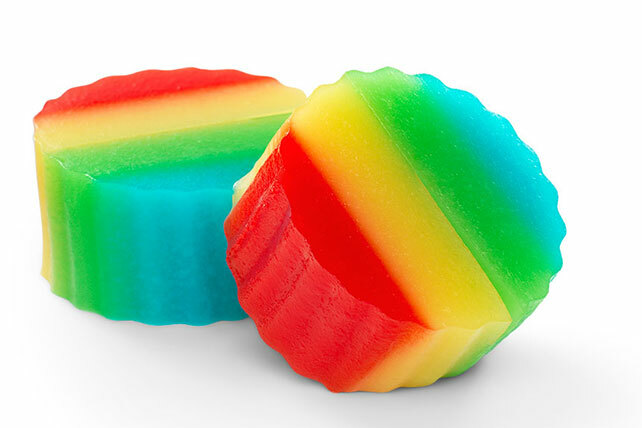 These fun and colorful JIGGLERS made from low-fat yogurt and JELL-O in a rainbow of flavors. Spray 8x4-inch loaf pan with cooking spray. Whisk 1 pkg. gelatin mix, 1/4 cup boiling water and 1 container yogurt in medium microwaveable bowl until blended. Microwave on HIGH 2 min., stirring after each minute. Pour into prepared pan. Refrigerate 40 to 45 min. or until set but not firm. Repeat in same pan with each remaining gelatin flavor to make a total of 4 layers, refrigerating as directed after each layer. Refrigerate 2 hours or until firm. Unmold onto cutting board. Cut gelatin into 12 slices. Use 2-inch cookie cutters to cut gelatin into desired shapes. Reserve scraps for snacking. Prepare using JELL-O Sugar Free Gelatin and light nonfat yogurt. Dip pan in warm water for about 15 sec. Gently pull gelatin from around edge with moistened fingers. Place moistened serving plate on top of pan. Invert pan and plate; holding pan and plate together, shake gently to loosen gelatin. Gently remove pan. Transfer gelatin to cutting board before cutting into shapes. Save 65 calories and 15g of sugar per serving by preparing with 4 pkg. (0.3 oz. each) JELL-O Sugar Free Gelatin.